For three years I ran my own home baking business, 280 Bakes. We specialised in vegan cakes, so I wrote an ebook on that very subject. Here's the ebook EASY VEGAN BAKING I released to Kindle in November 2018, helping people to get started with baking vegan cakes .Recipes, lifestyle tips, meal plans... It's all in there, really easy to digest (excuse the pun!) and available for just £5.99. 'Girl Meets Boys' is an embarrassing and hilarious journey through the perils of dating, and it gives the reader an unpredictably entertaining and cringe-worthy insight into a young woman's online search for a boyfriend. No detail is left unspoken in this narrative non-fiction piece, and is sure to make the reader laugh. A fantastic holiday read. Milton Keynes: A town famous for its roundabouts and concrete cows, but perhaps not for its fertile dating lands. As a single young woman new to the town, Louise signs up to online dating. 'Girl Meets Boys' holds nothing back in detailing her search for Mr Right in all the wrong places. An embarrassing and hilarious journey through the perils of dating, 'Girl Meets Boys' gives the reader an unpredictably entertaining and cringe-worthy insight into Louise's search for a boyfriends. MK Pulse is a high-end lifestyle magazine distributed to over 20,000 households in the Milton Keynes area. I have been writing for the publication since October 2010, providing at least one column every month. The articles centre on various subjects, looked at in a light-hearted casual style. Take a look at previous print issues online here. The wonderful team at Running Out Of Ink magazine have now published two of my short stories - 'An Empty House' and 'A Frosty Reception'. Keep an eye on this fantastic e-zine for more good reads. A crime collection of twelve short stories linked by the common theme that in every story someone has to die. I entered a competition in 2010 and won a spot in the anthology with my short story 'Catching A Stranger's Eye'. 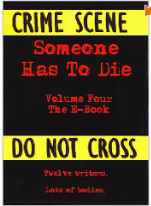 11 other writers were publsihed alongside me in a crime anthology, published by Spike the Cat. My featured story can be found here as a blog post. The ebook is available on Amazon at a bargain price of 85p, or paperbacks can be ordered by contacting me or emailing the publishers. 'Your Royal Wedding' was an anthology I compiled in Spring 2011 to commemorate the royal wedding of the Duke and Duchess of Cambridge. The brief for the competition was for writers to write in detail about how they spent the day of the wedding and their thoughts about the occasion. We welcomed memories of the entrants' own nuptials, and comparisons of Kate and Will's day with past royal weddings. Competition entries arrived from around the world (e.g. Australia, Canada, South Africa, USA), and 21 writers' pieces were shortlisted for publication. The book sold over a 3 month period for £5 - all profits went to UNICEF. I managed to raise over £130 which was wonderful. Thank you to all those who entered, promoted the book and bought copies, of course!